Infrared (IR) LED Market size is set to exceed USD 1 billion by 2024; according to a new research report by Global Market Insights, Inc. The global shipments are set to grow at over 17% CAGR between 2018 and 2024. 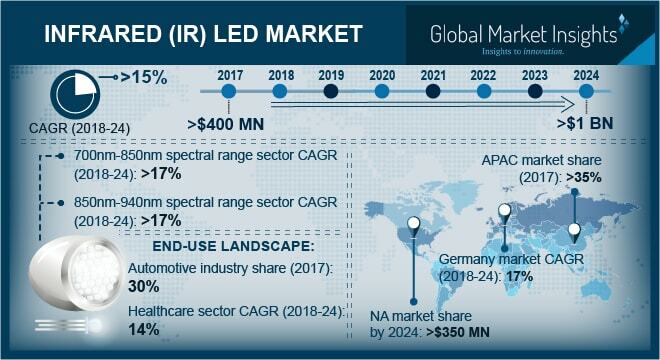 The IR LED market is projected to witness a significant growth over the forecast period owing to the increasing demand for cameras with night vision capabilities and remote sensing in automotive and consumer electronic industry. The demand infrared LED market in the automotive industry has grown owing to the increasing usage of these components in the exterior and interior lighting applications. Moreover, the industry has tremendous opportunities for growth in the future with their integration in wearable devices such as AR/VR and with the emergence of IoT enabled devices. The 850nm- 940nm wavelengths in the IR LED market are expected to grow at a CAGR of over 17% from 2018 to 2024, due to the increasing applications of these components in numerous applications. They are being widely integrated in the automotive systems, fueling the demand for components with this wavelength in the automotive and industrial sectors. The biometrics industry is the growing segment in the infrared LED market. This is attributed to the growing adoption of iris and facial recognition in electronic devices. This increasing adoption is being propelled by mobile payment services that create the need for secure and reliable authentication for users. Several LED manufacturing companies are taking advantage of these opportunities and are launching advanced components for biometric applications. For instance, recently GOME, one of the electronic retailers in China collaborated with Osram Opto Semiconductors to integrate the Iris recognition technology in their smartphones. The company has Osram infrared components on all their smartphone offerings. The growing smartphone industry globally is projected to spur the IR LED market for iris and facial recognition. North America IR LED market is expected to reach over USD 350 million by 2024 owing to the increasing demands from the surveillance industry. The U.S. has been the major country for adopting advanced surveillance technologies such as artificial intelligence, facial recognition and surveillance automation. The demand for such technologies is increasing across airports, commercial buildings and other public buildings. Surveillance has been integral to the U.S. for law enforcement and is part of critical national infrastructure. The vendors in the infrared LED market space are EVERLIGHT, Vishay Intertechnology, Epistar, Rohm Semiconductor, etc. The industry is witnessing extensive investments in these components to cater to the demands from growing applications in consumer electronics. To sustain competition, players have been focusing on new product launches and targeting the consumer electronics segment for larger market share. In 2018, Osram Opto Semiconductors expanded its product portfolio of IR LED by announcing six novel IR LEDs (IREDs) for automotive use. The addition includes 850nm IR components for applications such as pedestrian protection, night vision, and other exterior applications and 940 nm infrared components for applications such as gesture recognition, driver monitoring, and other interior applications. Several companies in the industry have shifted their focus on the infrared LED market considering the demand and the huge potential. EVERLIGHT in 2017 reported that business contributed 25 percent of its total revenue. The market share of Epistar in these LED chips was over 10% of all AlGaInP chip output in 2015.